© MichalKnitl | depositphotos.com — Small girl does exercises from mathematics at primary school in Finland. The educational system of Finland is considered to be one of the best in the world. A high level of education is one of the courses of the Finnish national strategy. The main line of the education system is its democratic character: equal opportunities to get an education for every resident in Finland. That means that all foreigners of compulsory school age have the right to receive the same basic education as Finns. In Finland, the emphasis is put on the process of training, but not on the examinations. 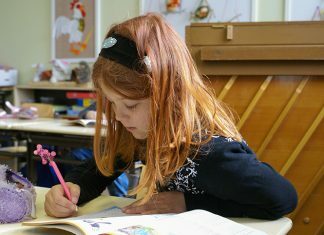 As there are no tests during all the period of secondary education at all, teachers are those who estimate knowledge of pupils during the educational process. A distinctive feature of Finnish education is that it is free. From 9 month to 5 years, parents have an opportunity to define their children to a kindergarten. It is optional, but fee. There are three types of kindergartens in Finland: municipal, private and family. Under the law, there are 4 children on 1 tutor. That is why groups are usually small. However, when children are 6 years old – system of a preschool education starts. It is optional and free and lasts for one year. It is provided in day care centers and kindergartens. The main goal is to prepare children for studies at school, so they study all necessary skills in a playful way. The real studies begin from 7 years when kids go to elementary school. That means that Finland allows their children to stay kids for a while and start school when they are actually ready to learn and focus. Basic education is provided by comprehensive schools and takes the age from 7 till 16 years old. There are classes from 1 to 9. Private school system almost does not exist (less than 2% of children go to private schools). As a rule, pupils choose schools where to learn, not on the contrary. There are nearly 20 pupils in class. The academic year begins in August and ends in May. Studies start no earlier than 9 am and usually end by 2 pm. Typically, pupils have 3 to 4 classes a day with a 75-minute length of each. Several breaks during the day are not only for a snack time but also to get some fresh air to be well rested and ready to learn. Pupils often have the same teacher for 6 years in a row. That allows teachers to make clear what kind of attention and learning style each student needs. The key point is to find an approach for everyone. Studies are in Finnish and Swedish. Active studying of English begins with the 3rd class, and then it is possible to choose facultative classes with studying the second foreign language. After ninth grade further education is optional. There are 2 options: an upper secondary school or a vocational institution. Textbooks and food are not free anymore, but studies are still free. Three years program of an upper secondary school prepares students for the Matriculation Test – state written exam. By the way, it is the very first exam that students have to pass and it determines their acceptance into University. School’s specialties and previous progress in school define the pupil’s choice of one or another upper secondary school. The upper secondary school promotes students to be good individuals and members of society, also it provides with the knowledge and skills that are necessary for working life and personal interests in their future life. Vocational institutions with its three-year program train students for various careers and at the same time, they keep an opportunity to take the Matriculation test and apply for University. After the final exams are passed, students choose either enter the workforce or to get further training. Vocational institutions provide students with vocational competence and capabilities for self-employment. For those who study using Finnish and Swedish languages, higher education is free. At the same time, education is not free for the foreign students who are studying using English language. Higher education comprises two sectors: universities and polytechnics/higher vocational schools. Universities are mostly oriented for scientific and research works. They have passed to two-stage model within the European reform of the higher education: the bachelor – the master with a European Credit Transfer System. A Bachelor’s degree can usually be completed in three years with 180 credits and a Master’s degree in additional two years with 120 credits. Scientific postgraduate degrees comprise licentiate (with additional 2 years) and doctor’s degree as the last step (also two years). Training programs of all universities are based on theoretical studying of disciplines with research activities. For these such forms of education as lectures, seminars, probations, independent works and so forth are applied. Polytechnics are characterized by providing in a multi-field environment the necessary knowledge and skills that are required by working life and the development of the country. The completion of a polytechnic degree takes 3.5-4.5 years. Polytechnics are for those who have completed either the matriculation examination or an upper secondary level vocational qualification. A specific feature of training programs is a strict orientation on professional education. Its quality and level are dictated by requirements of a labor market. For this reason, training programs are in a close contact with various regional enterprises of commercial, industrial and service sectors. Training programs obligatory include probations at the profile enterprises. So what is the educational secret of the Finnish success? Education in Finland really gives universal skills; it is more than useful knowledge: it is an ability to use this knowledge in practice. It is that case when less is more: quality of processes defines their success.